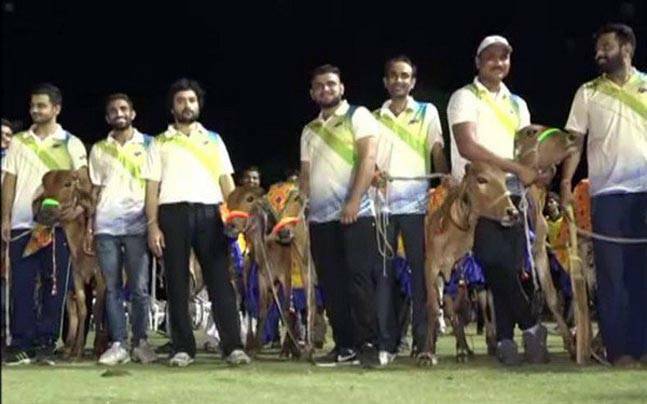 The Rabri community in Gujarat had organised the local cricket tournament, who are predominantly pastoralists, and decided to award a COW than a Trophy in very unusual way. Prakash Rabari, Organiser of the tournament said in the wake of controversy regarding cow slaughter, the organisers took this opportunity to raise awareness on cow protection and its importance within the society. ‘With this tournament we want to send a message that cow is a very important component in our society. Rabari community has always protected cattle as it is our livelihood,” he said as quoted. In a Prize ceremony, Man of the match was awarded a cow while each member of the winning team was given a calf. One of the player named Raju, who wants state government to declare cow as a National Animal to protect cows. “We want the state to recognize cow as the National Animal, only then can we save them,” Raju said as quoted. This tournament has defiantly put the other side of the same coin. After center issued a notification banning the sale of cattle for slaughter at market places, protests were held opposing such banned. None of the side is wrong, we need to have a debate which must exhibit a outcome where both sides are pinned to a meaningful conclusion.